When the reality of aging seems to start surrounding people close to you, you cannot help to start thinking about where you are in life and your own mortality. We just lost another family member, after her long fight against cancer, last night. She is the third among my father’s siblings who passed away in succession within less than three years: my uncle Virgil on January 16, 2012, my aunt Rebecca on February 23, 2013 and my aunt Fe on October 20, 2014. My mom Eva, my father’s wife, died earlier this year on March 15. They each weren’t that old, yet they are part of the generation just ahead of me and it’s heart wrenching to see a generation of siblings start to shrink in number. Somehow, it does not matter how old you are. The moment you start to see your own aunt and uncles, and your own parent, aging and passing away, you suddenly feel that some mysteries that used to lay ahead in the future have already unfolded. I remember thinking, when I would see photos several years apart, that we all have great genes. Aging didn’t seem to impact us that much, even just 10 or 15 years ago. Now, it seems that I’ve been in denial or asleep, like a science fiction character waking up in the 25th century after a cryogenic state. When I used to watch Buck Rogers as a child, I imagined what the future would be like, but I never imagined what the loss of people would feel like. I tried to do errands today and everything seemed different. My aunt Fe’s death is the sixth death in a recent series starting with my cousin Zeke on March 4, 2011, the deaths of my mom, two aunts and my uncle mentioned above, and Dennis, a dear close friend and godfather to my son, on October 31, 2013. Death is not just for the elderly. It can happen to people whom you would never think you would have to say goodbye to so early and you know what? The loss feels the same, no matter how old a person dies. The loss of an elderly person should hold the same weight as the loss of someone so young. Shock factor is not the same as value of life. 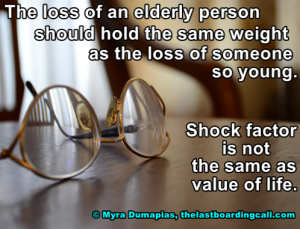 Of course, there is more shock for someone younger losing their life, but the loss is the same because the value of the life of an elderly person is not less. You see, with all the deaths in my family and circle of friends, I’ve encountered some statements that did not really help in my grieving: “But she was sick for a while, right?”, “She/he was already a grandmother/grandfather?”, “Were you really that close?”, or just simply, ” “, when people do not even acknowledge your loss or say anything what-so-ever and move on with businesses as usual. It might be easier for some to find words when a young or generally healthy person suddenly dies. It is true, when someone passes away at a young age, it is unfair because they did not have as much time on earth. However, again, the value of life is still the same. The loss may just be felt more among people of the same generation. Whether or not we think we can relate to older generations, we at least need to be sure our empathy levels are the same for all losses. If it is not, it is a reflection of a problem in our hearts and as a society. I’m grateful for my aunts and uncles, through whom I catch glimpses of my parents’ childhoods. I’m grateful for their hearts, their generosity, their strength and their faith. I’m grateful for all my cousins and my nieces and nephews whom I admire so greatly because I find warmth during times of loss. I’m grateful for all their love because they have shown that distance in geography and across that line between life and death does not mean distance in the heart. When an older generation starts to slowly become part of the past, to remain as stories on pages or oral traditions, our daily lives should feel less full, less enriched and a little more shallow. 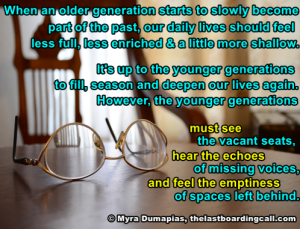 It’s up to younger generations to fill, season and deepen our lives again. However, the younger generations must see the vacant seats, hear the echoes of missing voices, and feel the emptiness of spaces left behind. Thank you to all who help me see that today’s younger generations are more than able to fill the spaces left behind by those who have passed on. This is dedicated to the Dumapias and the Vitug clans.